Who made that gorgeous painting of the monk? Shurely Stephen could have mentioned that. I haven't seen the episode yet, but going on what I've read on Twitter, do you mean this? If so, it was Stevyn Colgan, aka the forum's very own Stig. If not, I'll wait until I've watched the XL and have another guess. Unless someone gets there before me. Whaaaat?! Good grief. Nowhere near. 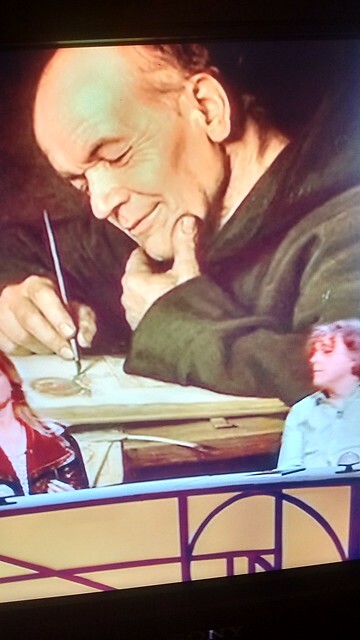 We're talking about a 1700-ish oil painting of a smiling monk busy writing on vellum. Ah. In that case, not a clue. Here he is; I was sitting with phone in hand, ready to pounce. Now - Who He and By Whom? Google Images doesn't give any joy. That looks to me like a modern painting. It looks like a cross between Alan and John Lloyd. It is sometimes surprising how lifelike some very old portraits are. They don't all look like half-senile old codgers or divinely inseminated maidens. I know* but there's something about the style of it that looks modern. *I did History of Art at school for two years. Bit bizarre as we were only 9 but the teacher was very good as it was her passion and it was refreshingly different. I agree with bemahan - definitely a modern style. I actually thought it was John Lloyd in costume for a brief second when I first saw it! So does that mean that when Stephen said "these are all mediaeval drawings", it was nothing but a pack of LIES?! He could have meant 'in the mediaeval style'. Maybe. I did like the arse trumpet. I wasn't sure whether it actually was an arse trumpet, or somebody having an enema.